Lamperti and Garbagnati was a camera maker in Milan in the late nineteenth century, and the early twentieth. The firm was started in 1883 by engineer Edoardo Lamperti and photographic goods-dealer Garbagnati, who took over a small existing photographic business. The firm's products were at first professional cameras. Later, cameras for amateurs were also made, including detective cameras. The company also retailed goods made by other makers (Storia della Fotografia states that they were the Italian distributor for Taylor and Hobson). Wet-plate studio cameras, as pictured here. McKeown lists an 18x18 cm camera; a 24x24 cm camera was sold at Westlicht. 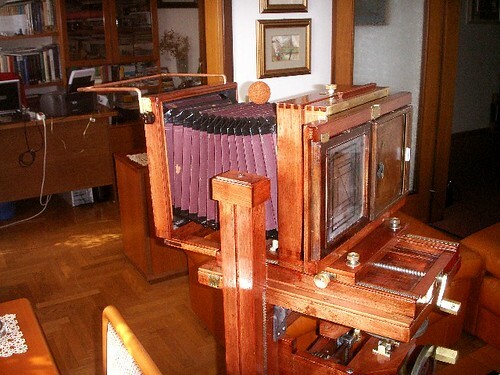 Spiegamento Rapido; horizontal folding camera for 9x14 cm plates. ↑ 1.0 1.1 Lamperti & Garbagnati at Storia della Fotografia (archived)(text in Italian). ↑ 2.0 2.1 2.2 McKeown, James M. and Joan C. McKeown's Price Guide to Antique and Classic Cameras, 12th Edition, 2005-2006. USA, Centennial Photo Service, 2004. ISBN 0-931838-40-1 (hardcover). ISBN 0-931838-41-X (softcover). p593. ↑ 23.5x23.5 cm tailboard field camera, about 1890, with 300 mm f/6.8 Dagor lens, offered (but not sold) at the 8th Westlicht Photographica Auction in November 2005 (click on the picture to enlarge it). 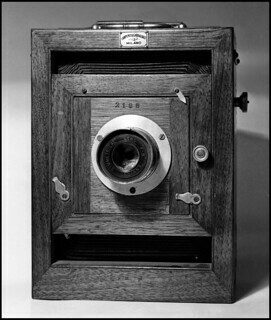 ↑ 24x24 cm studio camera on wheeled wooden stand, about 1900, with Dallmeyer f/3 portrait lens (presumably a Petzval lens), sold at the 21st Westlicht auction, in May 2012. ↑ 9x12 cm detective camera, about 1890, with Voigtländer lens and two Watson finders, sold at the 9th Westlicht auction, in May 2006. ↑ French Patent 491155, Appareil photographique perfectionné pour la prise de vues instantanées par en haut, particulièrement destiné à l'usage des aéroplanes, dirigeables et ballons, granted to Lamperti & Garbagnati in 1919, at Espacenet, the patent search facility of the European Patent Office.